Good Morning! 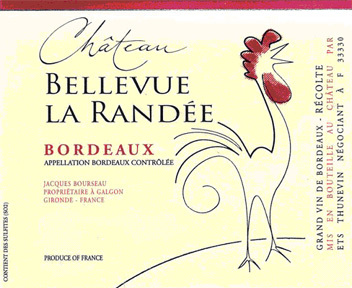 As promised I am including some background info on the winemaker of the wine I highlighted yesterday, Chateau Bellevue La Randee' Bordeaux. This wine was created by the impassioned husband & wife team of Jean-Luc Thunevin and Murielle Andraud. In 1989, they bought 1.48 acres (0.6 hectare) of land located in a small valley near Saint Emilion and established Château Valandraud. They have since expanded their domaine, which now represents a total of 10 hectares (24.71 acres), mainly located in Saint Etienne de Lisse. Jean-Luc Thunevin became a “star” in the wine world in less than a decade thanks to his world famous Garage Wine, Château Valandraud. He was nicknamed the “Bad Boy of Bordeaux” by Robert Parker, which then gave them the idea for the wine “Bad Boy” (Mauvais Garçon). Château Bellevue La Randée is located on the commune of Galgon. The winemaking is traditional, fermentation and aging taking place in concrete tanks. Average age of the vines is 20 years. In Sept 2008, I had the pleasure and honor of meeting Jean-Luc Thunevin, during an all day wine seminar/dinner at the Portland Harbor Hotel. Engaging and entertaining, he relayed his “Bad Boy” story via his rep/interpreter Christian Dalbavie, who incidentally was equally charming himself. We then proceeded to taste through some amazing and gorgeous wines – first on their own (with accompanying background information from Jean-Luc & Christian), then with another round paired with food. Heaven on earth! And I can’t wait until they come back! Incidentally, this wine is available at Old Port Wine Merchants, 223 Commercial St., Portland for $12.99. An amazing value!